Ten has launched a celebrity edition of its popular game show revival Family Feud. As with the regular version, this is hosted by Grant Denyer, but instead of families, this series pits celebrities up against one another. Mediaweek spoke with All Star Family Feud EP Paul Leadon to find the answers to questions we wanted to put up on the board. 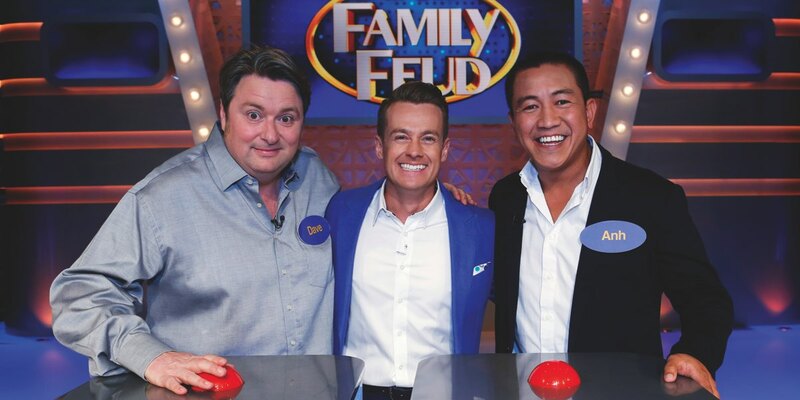 When toying with a licensed format like Family Feud, does the existing format licence permit you to do celebrity versions of the show, or do you need to license it as a new format? Formats generally include such spinsoffs, so it’s not a new licence as such, although as with all existing formats you need the approval of the format owner to make variations like this. So you do need to work with the format holder to give them assurance their format is being upheld and maintained consistently and for the good of the format. Luckily in this instance our production partner is the format owner, so it was a much easier process to evolve this version. The celebrities don’t have their actual families with them – are families necessarily integral to the Family Feud formula? The foundation of Family Feud is families, but the show’s premise is strong enough for families to be occasionally substituted. When you are dealing with a format that has approximately 50 productions airing around the world at any given time, you need a little variety. So any group of people who know each other can form a Family Feud Team – policemen, footballers, schoolteachers, actors. I think you always have to return to the mother ship, but the odd bit of variety – like All Stars – is a fine thing. What needs to be done from a production standpoint to accommodate celebrities and not regular family contestants? Not much really has to change. What I’ve found delightful about the All Stars experience is that even the most hardened celebrities go gaga when they walk onto the Feud set. There is something about Family Feud that gets to everybody – no matter how famous you are. Why “All Star” and not “Celebrity Family Feud”? We are hard on the heels of I’m A Celebrity… Get Me Out Of Here, and didn’t want there to be any confusion, so All Star instead of Celebrity. The joke around celebrity trivia shows is that the questions are made easier for celebrity teams. Are the topics any different for All Star? We tried to tailor some of the questions so they had a flavour of the Teams playing – for instance, a sports-related question for the footballers. But the thing about Feud is, it’s not about getting the answers correct, it’s about guessing the answer 100 Aussies gave. So, an extra knowledge of a subject is not an advantage. In fact it can often be a real disadvantage. Family Feud is a great leveller! When launching a version of a show like this with a twist, do you look to international versions for ideas? And if so, what did you take away from them? Rather than the US version, which is basically two half-hour shows butted together, we have followed the UK version of Celebrity Family Feud. This show is structured as a stand-alone hour. We didn’t need much else to go on. Fremantle and Ten are recording our 500th episode of Family Feud today. We have a pretty good idea of how the format works.